May 30, 2011 - U.S. scheduled passenger airlines employed 4.9 percent more pilots and 1.1 percent more maintenance workers in 2010 than in 2009 while total industry jobs declined by 0.5 percent, the U.S. Department of Transportation’s Bureau of Transportation Statistics (BTS) reported. BTS, a part of the Research and Innovative Technology Administration, reported that the six large network carriers employed 1.3 percent fewer pilots and 2.3 percent more maintenance workers in 2010 than in 2009. A separate group of the seven largest low-cost carriers employed 11.2 percent more pilots and 1.5 percent more maintenance workers from 2009 to 2010. The group of regional airlines employed 4.9 percent more pilots and 3.3 percent fewer maintenance workers from 2009 to 2010. Employment numbers for individual regional airlines can be found on the BTS website. Alaska Airlines had the largest decrease in maintenance employees for the network airlines at 6.7 percent. US Airways had the largest decrease in pilot employees for the network airlines at 2.6 percent. Delta Air Lines’ employment increases reflect its merger with Northwest Airlines that became effective for reporting purposes in January 2010. 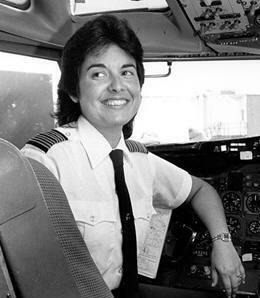 Beverly Lynn Burns, first woman in the world to captain the Boeing 747 airliner. All the low-cost carriers added pilots from 2009 to 2010 while only Southwest and Spirit Airlines reduced maintenance employees for this period. Allegiant had the largest increase in maintenance employees at 51.0 percent. Virgin America had the largest increase in pilot employees at 43.6 percent. Below are the numbers for 2009. Passenger Airline Employment 2009 - U.S. scheduled passenger airlines employed 6.4 percent fewer pilots and 7.2 percent fewer maintenance workers in 2009 than in 2008 while total industry jobs declined by 4.1 percent, the U.S. Department of Transportation's Bureau of Transportation Statistics (BTS). BTS, a part of the Research and Innovative Technology Administration, reported that the seven large network carriers employed 4.2 percent fewer pilots and 9.4 percent fewer maintenance workers in 2009 than in 2008. A separate group of the seven largest low-cost carriers employed 0.3 percent fewer pilots but 9.5 percent more maintenance workers from 2008 to 2009. Delta Air Lines added 190 pilots, a 3.0 percent increase, the only network airline pilot increase from 2008 to 2009 while United Airlines had the greatest percentage decrease in pilot employment of the network airlines, -12.1 percent. Northwest Airlines had the largest increase in maintenance workers of any network airline from 2008 to 2009 while United Airlines had the largest decrease. Low-cost carriers JetBlue, Southwest and Virgin America added pilots from 2008 to 2009 while the other low-cost carriers reduced pilots. Spirit Airlines had the largest decrease in pilot employment followed by Allegiant Airlines. Virgin America had the largest increase in maintenance workers of any low-cost airline from 2008 to 2009 while AirTran had the only reduction. Scheduled passenger airlines include network, low-cost, regional and other airlines. Network carriers operate a significant portion of their flights using at least one hub where connections are made for flights on a spoke system. Low-cost carriers are those that the industry recognizes as operating under a low-cost business model, with lower infrastructure and aircraft operating costs. The merged US Airways and America West Airlines began joint reporting of annual employment numbers in 2008. US Airways' employment numbers for previous years do not include America West, which is included in Tables 1, 4 and 7 as a low-cost carrier for 2000. America West did not file a 2007 report. Airlines that meet the reporting standards report annual employment numbers by job category to BTS. The annual numbers are a 12-month average for the year and are not comparable to the full-time equivalent employee numbers issued monthly by BTS. Airlines that operate at least one aircraft with the capacity to carry combined passengers, cargo and fuel of 18,000 pounds – the payload factor – and have annual operating revenue of more than $20 million must report annual employment data. The seven network carriers employed 13.4 pilots per aircraft in 2009, up from 13.2 pilots per aircraft in 2008. The low-cost carriers employed 10.2 pilots per aircraft in 2009, down from 11.2 pilots per aircraft in 2008. Alaska had 10.8 pilots per aircraft in 2009, down from 12.0 per aircraft in 2008, the fewest of any network airline. Delta, with 14.9 pilots per aircraft, was unchanged from 2008, but had the only increase in the number of pilots from 2008 to 2009 and had the most pilots per aircraft of any network carrier. Allegiant had 6.7 pilots per aircraft in 2009, the fewest of any low-cost airline, compared to 9.3 pilots per aircraft in 2008. Spirit, with 14.9 per aircraft, although down from 15.5 per aircraft in 2008 still had the most pilots per aircraft in the low-cost group. The passenger airlines had 7.9 maintenance workers per aircraft in 2009, down from 8.9 per aircraft in 2008. The network airlines had 12.4 maintenance workers per aircraft in 2009, down from 12.9 per aircraft in 2008. Spending by network airlines for outsourced maintenance decreased from 42.8 percent of total maintenance spending in 2009 to 38.9 percent in 2009. The low-cost airlines had 3.2 maintenance workers per aircraft in 2009, the same number per aircraft as 2008. Spending by low-cost airlines for outsourced maintenance increased from 54.6 percent of total maintenance spending in 2008 to 55.6 percent in 2009. Northwest had 4.0 maintenance workers per aircraft in 2009, the fewest of any network airline. Northwest's spending for outsourcing declined from 65.9 percent of total spending in 2008 to 59.8 percent in 2009. American Airlines had 20.8 maintenance workers per aircraft in 2009, the most of any network airline. American's spending for outsourcing was 23.3 percent of total maintenance spending in 2009, the lowest percentage spending share of the network carriers. JetBlue had 2.4 maintenance workers per aircraft in 2009 the fewest of any low-cost airline. Of the low-cost airlines, Spirit spent the smallest portion of its maintenance expense on outsourcing at 3.5 percent. Southwest had the highest percentage share for outsourcing at 61.7 percent. Spirit had 6.4 maintenance workers per aircraft in 2009, the most of any low-cost airline and up from 2.1 employees per aircraft in 2008. Spirit's spending for outsourcing decreased from 22.6 percent of total maintenance spending in 2008 to 3.5 percent in 2009.